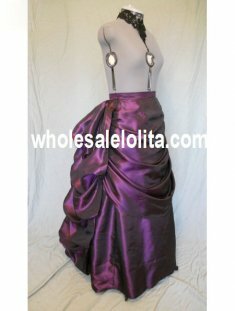 The skirt bustle is the lesser known but equally beautiful Victorian skirt. When most people think of the Victorian era, they think of the hoop skirt. However, the hoop skirt went out of style in the 1870s, and was replaced with the bustle dress. Although this dress isn’t the definitive style of the Victorian era, it is nonetheless a major contributor to the overall style of the era. The bustle dress style went through three distinct periods. The first period was the Early Bustle Period, which lasted from 1869-1876. In this period, a separate bodice and skirt were worn, and the bodice was characterized by a high neck and a tight fitting sleeve. 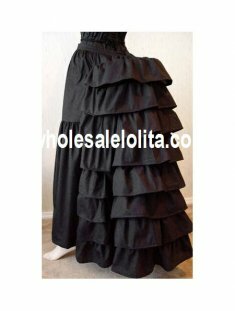 The skirt bustle had petticoats underneath it to still give it volume. 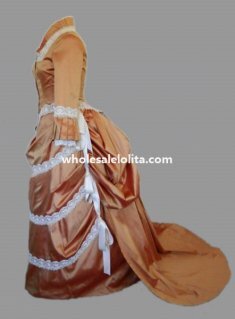 The Natural Form Period lasted from 1877-1882, and did away with the bustle completely. 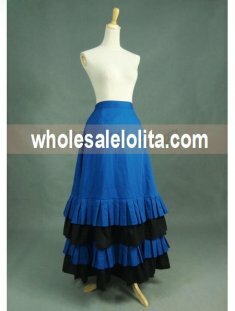 However, pleats and draping still gave the effect of a skirt bustle although there was no physical bustle present. Fullness in the skirt was usually drawn to the back so that the silhouette in the front was flat. The Late Bustle Period appeared in 1883 and lasted until 1889. A true bustle became popular again, and was much more extreme than the previous ones. The bustle skirts were higher and larger than previous bustles, and many times drapery similar to the Natural Form Period was seen.